Left fuel injection equipment is installed, the inlet and outlet pipes and the middle baffle. Right drive mechanism are decompressor, butyric centrifuge, generator, starter, or PD, nozzles and the fan shroud. The oil cooler is located under the hood. 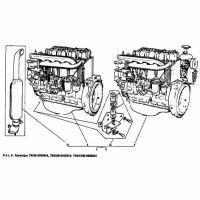 Front filler neck is present, a fan, hour meter, hydraulic pump, fan drive pulleys and alternator. Behind directly attached to the crankcase flywheel cover. Adjust the fuel mode is carried out with the help of the throttle disc which are put before the protective mesh of the fan and oil cooler. When cold outside the oil cooler must be disconnected from the oil system, and set the throttle to drive three pins before the protective mesh of the fan and secure with the wing nuts of the three. With the air temperature of + 5 ° or more oil cooler should be included in the system, and remove the disk and sent to storage. Control the heat status. Engine according produce readings remote thermometer that indicates the temperature of the oil in the lubricating system. To start the system applies an electric starter or PD, candles heating the intake air and the decompression mechanism. Blow occurs through the vapor tube attached to the housing HS drive pump.